Fresh off attending Araxi's Longtable Dinner in Pemberton, I was invited another Top Table Group event. 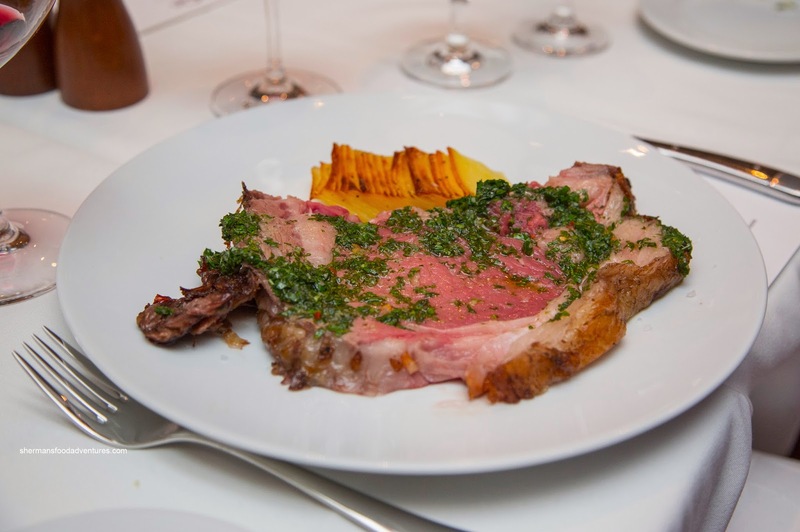 This one was held at CinCin Ristorante + Bar and featured a collaboration between Executive Chef Andrew Richardson and guest chef, renowned Argentinian Chef Francis Mallmann. 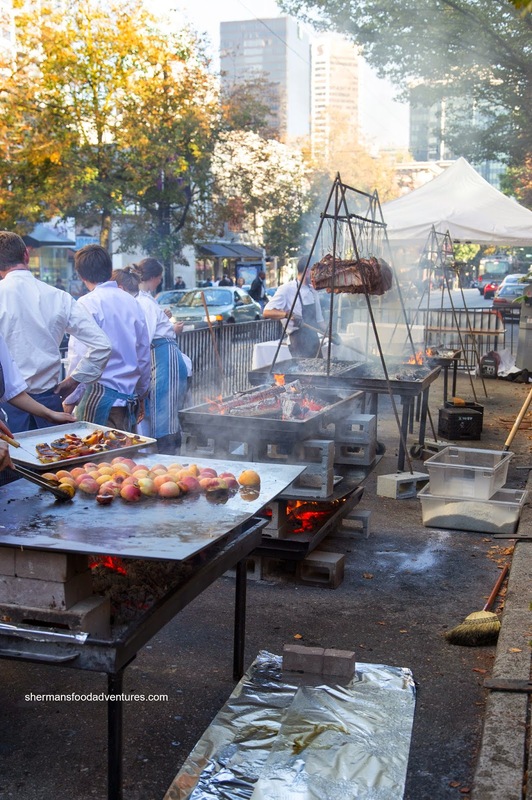 Living up to the event's namesake and Chef Mallmann's expertise in open-fire cooking, 5 parking spots in front of CinCin were cordoned off for the grilling spectacle. Drawing quite the crowd along Robson Street, an army of chefs were preparing salmon, salt-crusted halibut, beets, fruit and beautiful whole rib roasts hanging over an open fire. For all this work, the result would be 2 separate tasting events on back-to-back nights. I attended the 4-course meal with choices in each course ($99.00). For my first, I decided on the Smashed Beets with garlic chips, arugula & goat cheese. 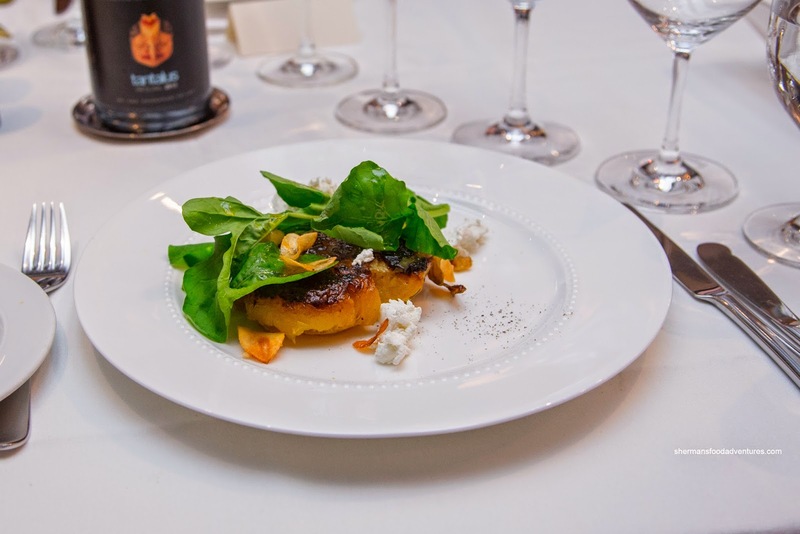 Hidden beneath the peppery arugula was a large yellow beet that had been pressed down onto a hot grill. Hence, there was extreme caramelization in terms of its appearance and taste. The smoky and sweet exterior of the beet was elevated by the impactful garlic chips. Since the beet itself was not seasoned aggressively, the nuggets of salty goat cheese did the heavy lifting. 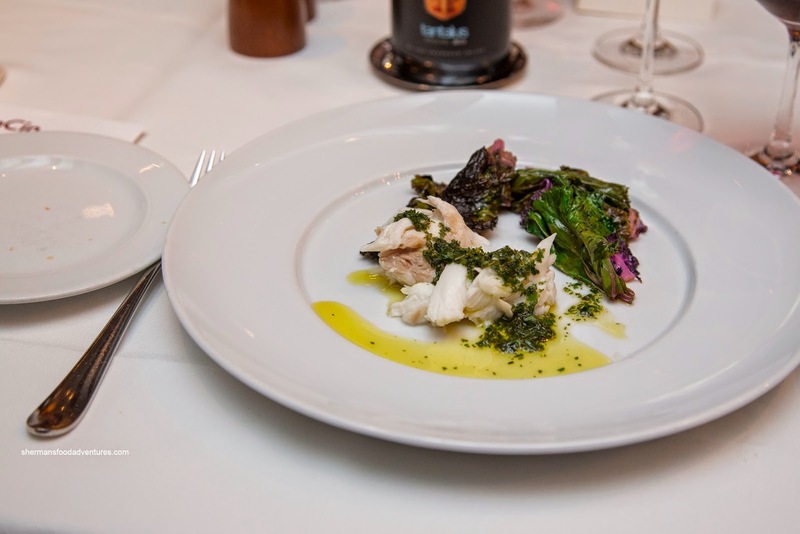 For my next dish, I had the Salt-Crusted Halibut prepared in the "infiernillo" with salmoriglio and burnt kale salad. The tender flakes of halibut were nicely accented by the salmoriglio consisting of parsley, oregano, lemon, garlic and olive oil. Yes, this is somewhat similar to chimichurri except being lighter and acidic. I really liked the kale salad as the leaves retained an appealing chewiness while completely cooked with a noticeable smokiness. There was, however, a bit too much salt for my liking. Forget about everything else, my focus was on the third course! With a cut that made me full by just looking at it, the Slow Roasted Rib-Eye on the bone dared me to eat it all. That I did! For some at the table, the meat was too rare, but for me, I didn't mind it because the meat was still sufficiently tender and full of flavour due to the copious amount of fat. Furthermore, the flavour quotient was elevated with the generous smear of chimichurri on top. It was plenty garlicky, salty and herby. The side of domino potatoes were soft, yet firm enough to retain its shape with each slice. 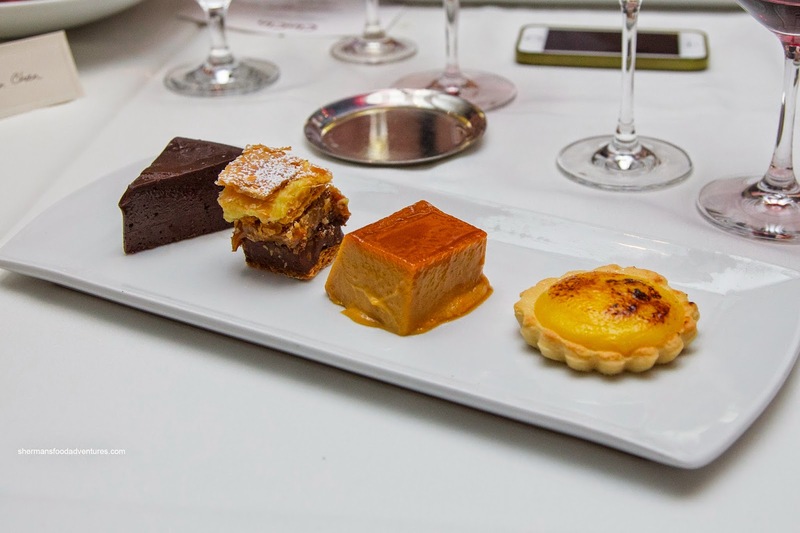 Lastly, there was a choice between a fruit dessert or a sinful platter of Chocolate Nemisis, Napoleon, Dulce de Leche and Lemon Tart. Guess what I chose? Starting off with the nemesis, it was rich and decadent. There was a muted sweetness sandwiched in between bitterness. I found the Napoleon really sweet while the dulce de leche to be even sweeter. It was creamy and rich though. My favourite was the lemon tart by far. The firm crust was buttery and texturally on point. As for the charred lemon curd, it was purposefully sweet while equally tangy. This was a sweet (literally) finish to an interesting meal that was definitely one-of-a-kind in Vancouver.